At first listen, A>S>H>S could easily come off as a stereotypical jam band. But to dismiss the group as just another one of the crop of bands spawned by Medeski, Martin, and Wood would be a mistake. Where MMW and similar groups sometimes fail to maintain a steady concept throughout their albums, the Houston-based jazz ensemble A>S>H>S (pronounced "ashes") takes experimentation and improvisation to another level. The opening "Kleen" begins with a "Shine On You Crazy Diamond"-like, synth-laden intro that quickly moves into the band's trademark playing, interspersed with repetitive samples about testing an atomic bomb. This twelve-minute song is the perfect introduction to the group: its immaculate beats, subdued keyboards, and moody, sometimes punchy saxophone showcase each member's talents well. Similarly, "Corpus Raton" flows with melodic precision, and its eerie samples ("Choice is an illusion," for instance) offer fair warning that A>S>H>S is not an ordinary jazz group. The unexpected hilarious snippets of Chevy Chase from National Lampoon's Vacation ("Excuse me, Holmes...") on "Nova" show that the band doesn't have to take itself too seriously in order to create good music. The song's tribal rhythms, along with its smooth sax and '70s-style keys create a dynamic, driving force. It is immediately obvious that this band is in its ideal element in live performanceit's infamous for downtown Houston warehouse partiesbut its music translates well on record. 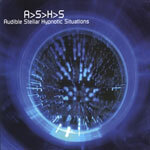 Audible Stellar Hyponotic Situations also includes two in-studio improv tracks, "Situation 1" and "Situation 2," which drive the point home. Both songs, recorded in 2004 at Houston's legendary Sugarhill Studios, are indicative of these players' penchant for letting the music speak through their instruments, yet they never meander too far. And this is their strongest feature: the fact they can weave elements of jazz with hints of funk, hip-hop and classic rock, but still maintain cohesiveness throughout. Pulling this off would be a challenge for most bands, yet A>S>H>S makes it seamless and nearly effortless. Track Listing: Kleen; Corpus Raton; Nova; Lost; Act Fast; Stellar; Situation 1; Situation 2. Personnel: Jason Williams: drums, percussion, programming, synths, producer; Scott Nichols: bass guitar; Xavier Gonzales: congas, aux percussion; Christopher Karl: turntables, visuals, design; Joseph Berryman: tenor saxophone; Chad Hilger: keyboards.